For the last six months, Hulu has taken one big swing after another as it tries to close the gap with Netflix and Amazon. At Wednesday's NewFronts presentation, the streaming service revealed the perfect cherry atop its growing pile of huge deals: landing exclusive streaming rights to all nine seasons of Seinfeld. In a multiyear deal worth as much as $180 million, Hulu will begin streaming all 180 episodes of Jerry Seinfeld's iconic comedy "about nothing" in June. While Sony's ad-supported Crackle has long streamed a selection of Seinfeld episodes, this will be the first time the entire series will be available for streaming. And unlike the trimmed, syndicated versions, Hulu will stream the full-length episodes that originally aired on NBC. "This is a pretty mind-blowing moment," said Jerry Seinfeld, who closed Hulu's presentation at New York's Hammerstein Ballroom with the big announcement. "You could have put the DVD in, but I guess nobody really wanted to do that. They want to do this!" He added of streaming services like Hulu, "I know from having kids, it's the only way they're going to watch it." The Seinfeld coup eclipses Hulu's three-year deal with South Park last July to stream all 18 seasons of that show, which was worth a reported $80 million. 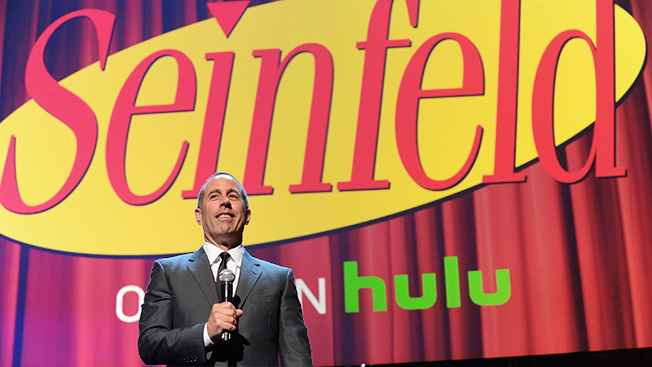 Seinfeld's Hulu debut this June is likely to revive interest in the series—Mulva! The Contest! Sponge-worthy! Festivus! Soup Nazi!—much like when Netflix started streaming Friends in its entirety in January. But the Seinfeld acquisition was only one of several big announcements Hulu made at its NewFronts presentation where CEO Mike Hopkins vowed that "2015 is the year that Hulu will break out." It's already well on its way. Hulu Plus subscribers jumped 50 percent in one year, from 6 million to almost 9 million. And in the first quarter of 2015, streams were up 77 percent—700 million hours of premium content—with each Hulu viewer watching an average of 30 percent more content this year than last. "The Hulu of a year ago is remarkably different than Hulu today," said svp of content Craig Erwich, who ran through Hulu's recent "landmark" deals for exclusive content with cable companies like Viacom, Bravo, Discovery, E!, Turner and FX Productions, as well as securing streaming rights to this season's most popular new show, Empire. Erwich also announced a multiyear deal with AMC Networks for exclusive streaming rights to new and upcoming series from AMC, IFC, BBC America, Sundance TV and WE tv. That includes AMC's highly anticipated Walking Dead spinoff, Fear the Walking Dead, set to debut later this year. On Tuesday, Cablevision and Hulu reached an agreement to offer Hulu Plus to Optimum customers, making it the first cable or satellite provider to distribute the streaming service. Hopkins said Hulu will announce more MVPD deals later this summer. And while Hulu is part of the NewFronts, svp of sales Peter Naylor referred to its presentation as an "upfront" because "Hulu is TV," even as "the TV ad model is being redefined." Eighty-two percent of Hulu viewers are 18-49 years old, with a median age of 33. And Hulu ads "can't be time shifted by a DVR," said Naylor. Instead of C3 or C7, "it's always C-right now." When Hulu—which is jointly owned by Fox, Disney and Comcast—launched in 2008, its content was only available on computers. Now, as Hopkins noted, more than 60 percent of Hulu viewers no longer stream its content on a computer. Instead, "they watch the best screen available," he said, which usually means television at home and mobile devices on the go. The presentation featured appearances by many of the A-listers in Hulu's upcoming original series. J.J. Abrams and an underdressed James Franco ("It's my first upfront, so I didn't know how fancy it was," said Franco, who was wearing jeans and a leather jacket) touted Hulu's biggest new series, 11/22/63, executive produced by Abrams and based on the Stephen King novel about a high school English teacher (Franco) who travels back in time to try to prevent President John F. Kennedy's assassination. Jason Reitman talked about Casual, a family comedy premiering later this year that he is executive producing. Amy Poehler was on hand to discuss Difficult People, a comedy she's executive producing. Debuting this summer, it stars Billy Eichner and Julie Klausner as best friends who hate everything but each other—the show's hilarious trailer got the best response of the presentation. "They spent $130 million on Seinfeld, but once on set, they told me I couldn't get an 'everything bagel,'" joked Eichner. Jason Katims discussed The Way, his new drama about a family in a "provocative faith movement," debuting this fall. And YouTube sensation Freddie Wong was on hand for RocketJump: The Show, which airs this fall and goes behind the scenes as his company RocketJump creates its latest short films. Naylor also announced custom-integrated commercials—Hulu will create 30-second spots that will integrate both a marketer's brand and Hulu's. "We want to create ads that viewers and advertisers love," said Naylor. Judging from the company's splashy presentation, they're offering plenty of new content that viewers and advertisers are clamoring for as well.